Wastewater flows through a retention pond built to contain and remove heavy metals from the Gold King Mine outside Silverton on Aug. 12, 2015. The U.S. Environmental Protection Agency accidentally triggered a spill of 3 million gallons of wastewater from the mine. The Obama administration said it could not legally repay any of the claims for damage from the spill, but the Trump administration promised last year to reconsider. As of Friday, no claims had been paid, but the agency said it is continuing to review them. DENVER – Three years after the U.S. Environmental Protection Agency triggered a massive mine spill that polluted rivers in three states, the federal government still has not repaid any of the victims for the millions of dollars in economic damage they claimed. 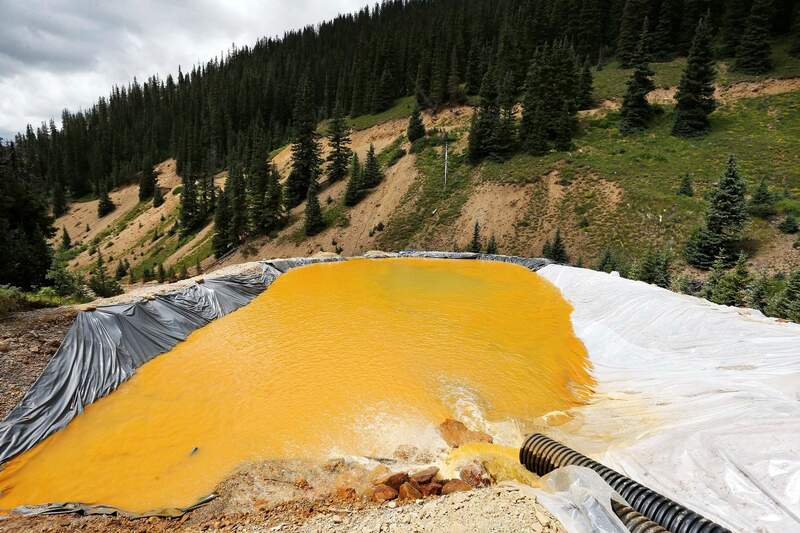 The EPA said this week it is making progress on reviewing about 380 claims for lost income, fallen property values and other losses from the 2015 spill at the Gold King Mine outside Silverton. An EPA-led contractor crew was doing excavation work at the entrance to the Gold King Mine on Aug. 5, 2015, when workers inadvertently unleashed 3 million gallons of wastewater pent up inside the mine. The water sent a mustard-yellow plume of pollution into rivers in Colorado, New Mexico and Utah. The Navajo Nation and other tribal lands were also affected. The EPA estimated the water carried nearly 540 U.S. tons of metals, mostly iron and aluminum. “We weren’t asking for the sky. We were asking for what we lost,” said John Flick, co-owner of Duranglers, a fishing guide service and store in Durango. The EPA paid out millions of dollars to state, tribal and local governments for the cost of responding to the spill and for water tests. But the Obama administration, which was in charge at the time of the spill, said in January 2017 it could not pay for any economic damages. The administration cited sovereign immunity, which prohibits most lawsuits against the government. That provoked a furious political backlash, and the new Trump administration said it would reconsider. One year ago, then-EPA chief Scott Pruitt visited the Gold King Mine and promised to review all the claims. Mickel filed a claim but declined to say how much. He said the EPA has never acknowledged getting it. “‘We’re going to make people whole,’ that was their words,” Mickel said. Pruitt resigned amid a storm of ethics scandals in July, and the EPA is regrouping under acting chief Andrew Wheeler. But the review is making headway, agency spokesman James Hewitt said. The EPA sent letters in June to 54 people who filed claims, or to their attorneys, asking for clarification or more information, Hewitt said in an email to the AP on Thursday. Only a few have responded, he said. Separate from the tort claims, at least four lawsuits have been filed against the EPA over the spill. Utah is seeking $1.9 billion, the Navajo Nation $162 million and the state of New Mexico $130 million. About a dozen New Mexico residents also sued, seeking a combined $120 million. The lawsuits are pending in federal court in Albuquerque.